Negeri Perlis Indera Kayangan is the smallest and northern-most state in Peninsular Malaysia. 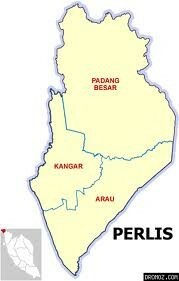 Consist of 3 districts, there are Padang Besar, Kangar, Arau. The capital of Perlis is Kangar. The state shares a border on the north with Satun in Thailand; on the east and south with Kedah; and on its west with the Straits of Malacca. It is a mere 810 sq. km wide, with a rather large part of the state below 61 meters above sea-level. Perlis's highest point is Gunung China, measuring 721 metres.